We personally have not been Costco members before, but after hearing about all the natural and organic options they offer, we are planning to become members. I was really happy when Costco reached out to me to help get the word out about their grand opening. They graciously sent me some natural products to try like a big bottle of avocado oil, some natural Jenna Hipp nail polish and Kirkland all-natural body wash. Costco also offered up a giveaway for you guys that include a gift bag with some of their best organic, natural products, valued at $190! Pretty great products if you ask me! To enter to win the Costco gift bag*, just leave a comment on this blog post with your favorite Costco product. The giveaway will end on June 5 when a winner will be chosen at random. Good luck and see you at Costco this summer! * You don’t have to live in Perrysburg to win the gift bag – we’ll ship it to you where you live. Disclaimer: Costco provided me with product to try and the gift basket to giveaway. I only write about companies and products I enjoy and believe it. I love that Costco is carrying more organic products. I enjoy their frozen organic cherries- I like to add them to my smoothies. I love their huge bag of pistachios and their chicken jerky dog treats ….and the large block of sharp cheddar cheese. Oh! and their container of feta is wonderful! Our first Costco opens this week! Can’t wait. When I visited friends, they had the Daniele Salame Chub Charcuterie and it was delicious! Hope they have that here!!! I love their selection of living room furniture! Hard to choose one favorite…I would say the chocolate covered raisins! My favorite item is either the organic maple syrup or the coconut oil. My favorite Costco product is Kirkland Signature Organic Animal Crackers. They make a great snack for the kids. I like to get frozen fruit at Costco. I haven’t been to Costco in a while, but I used to get their dog treats and my dogs loved them. My favorite Costco item are their variety muffin packages. I have never been to Costco but it sounds like I should visit! I have never been to a Costco…they don’t have them where I live. Thanks for this fun opportunity. I hate to admit it but we spend too much time and money at Costco. Ella goes through a lot of fruit so we always get berries, apples and grapes.. Love that they continue to expand on their organic products including meats, eggs, etc. Right now, my favorite Costco product is my air conditioner. I forget about them for things like HVAC, carpet, cars, trips, but when I remember, I’m happy. I also like their organic chicken and ground beef. My favorite Costco product is the Kirkland Signature Italian Style Beef Meatballs. Every since I tried to make my own meatballs at home (major fail), I’ve been tasting people’s at gatherings and dinner parties. I finally broke down and asked my chef friend how she makes her meatballs. She said “I start by going to Costco, I walk down the frozen foods aisle, then I grab a bag.” LOL! I was not expecting that. Since then, that’s where I get my meatballs for parties. You can’t beat them with a stick! so excited to not have to drive to Sylvania anymore! Hmm we love tons of things there! Organic guac cups are Ds favorite and Anna loves the hummus cups in her lunches. Their organic whole chickens are great for bone broth! We currently don’t have a Costco membership but I’ve been told they have really cheap and a good size rotisserie chicken and I’m so excited about that! We have never been Costco members but we are excited to check it out! We have never been Costco members before but we are excited to check it out! We love their meat for cookouts and their Kirkland dish soap is amazing! Love costco! We purchase a lot of the above mentioned products. Avocado oil is a staple in our house. We love the Veggie Sticks, chocolate coconut almonds, quinoa and Kale salad! I have two current favorite Costco products: the Natural Huggies wipes case and their coconut oil! We use the wipes all over the place (can I still buy them after we’re out of diapers??) and the coconut oil has become an every stable. I use it for cooking and baking, skin irritations and our teeth. Awesome! I love the frozen tilapia. Such a great easy dinner and my kid likes it! 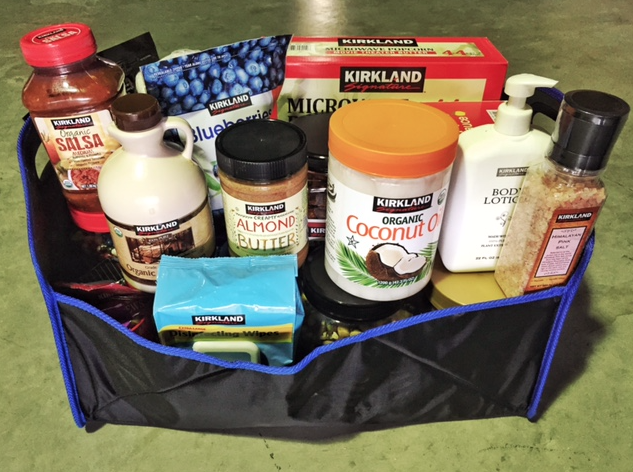 We love Costco and this awesome giveaway! It’s about 25 minutes away from our house so we visit often. My favorite item right now is the Kirkland Signature Breakfast Blend Coffee K-Cups. Great flavor and value! We love the coconut oil, but they have some pretty amazing cuts of meat as well!!! Costco rules! Their frozen fishes especially the Mahi are the best. The prices at Costco make it more affordable for us to cook and eat healthy meals every day. Call us crazy but my hubby and I shop at Costco 2x weekly! Love the maple syrup and seaweed chips! I’ve only been to Costco once and I cannot wait for it to open in Perrysburg! I have had the Sander’s sea salted dark chocolate covered caramels and let me tell you….. Oh my heavens!!! Excited to try more things once we get a membership. They have the best smoked salmon, at the right price, with no nitrates or nitrites. I don’t know how I ever survived without Costco! We have been members for 15 years and We love it. My current favorite is their two-pack of coconut oil-one jar goes in the pantry and the other goes up to my bathroom. Soooo excited to have them down the street from our house, because I can go every week! This is awesome and Costco is pretty great! We are a huge fan of their coconut oil! The container is huge which lasts a while considering I use it all the time. Oh man….our family loves Costco. We do most of our shopping there! We love “cashew cluster” for a yummy on-the-go treat, Jane has been diggin’ the organic fruit strips lately too! Excited for Costco to open in Pburg! Now I really didn’t have to leave :) Can’t wait to stock up!!! How awesome, Liz! I’ve never been a big shopper at big box stores, however I think I’m ready to take the plunge with the new Costco opening! I have had a few of their products. The individual hummus cups are great and we always have the Annie’s gummy bunnies in our pantry! Love Costco even more since its 5 mins down the road from us :) favorites are organic berries / veggies , coconut oil, lamb chops and chicken ! I have never been to Costco but I am so excited to try it out knowing now that they carry so many organic products! Woohoo! Thanks so much for sharing! This is genius, Liz! I’m a Costco fanatic. My favorite Kirkland product is the baby formula–generous amount, brilliant price. We love Costco and their brand, Kirkland. We buy the Coconut Oil and Almond Butter among many other things! Love Costco! Just rejoined as a member (actually coerced my brother to put me on his membership). Love the salmon and rotisserie chicken there. It’s always great for us for parties – stock up on all the essentials – drinks, plates, plasticware, to-go boxes. We love their lamb chops!! we belong to Costco, love their lamb chops! That’s awesome Liz. I’m sad that the closest Costco to us is an hour and a half away. Maybe we will get one some day, before we move. When I am able to go though, I enjoy pretty much all of their Kirkland brand products. I especially like their coconut oil. We love buying paper products, diapers, and apple sauce pouches. Kirkland has their own apple sauce pouches now and the kids love them. We currently do not have a Costco membership but have heard wonderful things about the stores and products. We have tried some of their organic products at play dates and loved them. We love their guacamole and their coconut oil! And a million other things!! We just joined Costco for the new one opening in Perrysburg; I have never been in this store before but I’m so excited to try it! I’ve had several of their products at cookouts with friends. I love their meat and also chips and guacamole! I love getting lunch box items there especially the snack sized popcorn, string cheese and yogurt. I also love the Kirkland brand camisoles. I have been buying them for meals. Oh and we love to buy our meat there for cookouts!